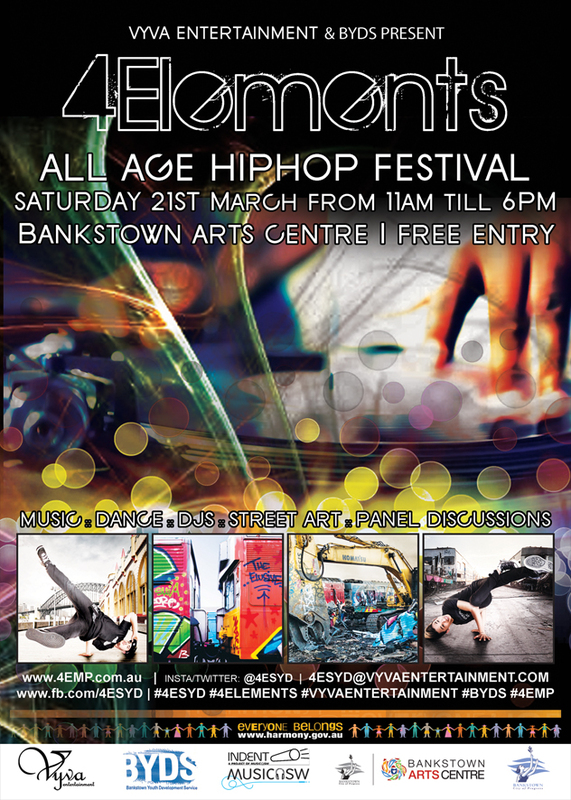 4Elements: Free All Age Hip Hop Community Festival | Saturday March 21st feat. Matus, Mirrah, Mistery, Mk1, Dance Kool & More | Music, Breaking, Street Art | SOUL OF SYDNEY FEEL-GOOD FUNK SOUL DISCO vibes & beyond. Our recommendation for everyone who has been asking us for family kid friendly events. Our good friends are putting together this free kid friendly community based event in a couple of weeks called 4Elements. 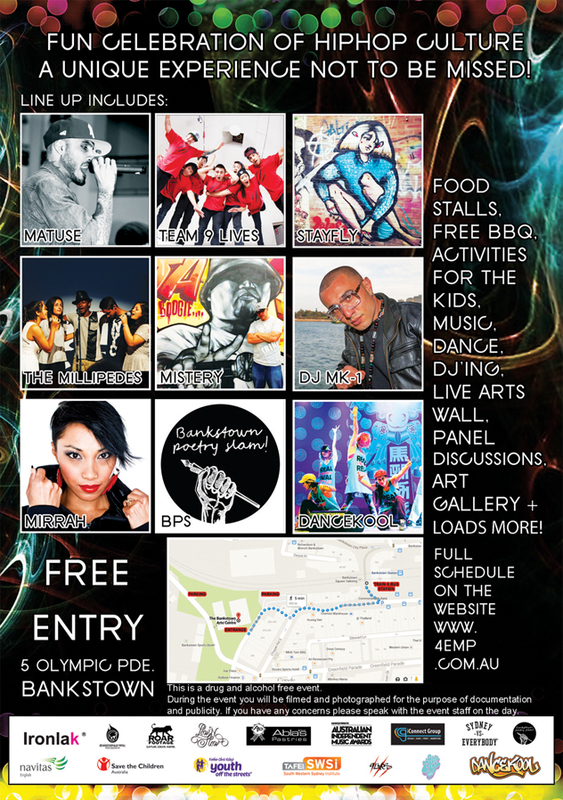 4Elements is a FREE all-age community (alcohol & drug free) festival to coincide with Harmony Day. An afternoon of Hip Hop music and street culture, including; Spoken Word, DJ’s, Music, Breaking showcases, Street Art, workshops as well as some Industry Q&A and Hip Hop Discussion Panel. 4Elements is a FREE all-age community (alcohol & drug free) festival to coincide with Harmony Day.It’s a project that has been birthed from a need, which has been brought to our attention by young people within the Bankstown LGA and surrounding areas. We now have access to the people, the space and resources that can make this dream a reality. How is Hip Hop connected to Harmony Day? The tag line and message of Harmony Day 2015 is ‘Everyone Belongs’ which fits perfectly with the concept of Hip Hop. Hip Hop is about unity, acceptance, socio-political awareness and creating something from nothing. Harmony Day is a day of cultural respect for everyone who calls Australia home, a time to reflect on where Australia has come from, while also recognising the traditional owners of this land. Our cultural diversity is one of our greatest strengths and is at the heart of who we are. It is the spirit that connects the past to the present and lays a path towards the future. Australia is home to our Indigenous people and people from over 200 countries around the world, with more than 300 languages spoken in Australian homes. Hip Hop provides a sense of belonging for all willing to embrace it and generally attracts young people and minority groups as it offers an environment where self-expression is encouraged, stimulating conversation and provides an opportunity to just be without being discriminated against. MATUSE is an international artist, actor and writer who ambitiously grounded his feet in the entertainment realm both locally in his Sydney hometown and globally, making New York City his headquarters. Coming off the theatrical success of sold out consecutive shows in Sydney, MATUSE spent 2014 in Dubai for the hugely successful Cluster of Lights theatrical tour. His latest album, Third Eye King, collaboration with producer Kazi, set the tone for his upcoming full length release, Tuséy, as well as the collaborative release of Groundwork and his first book tentatively titled Travelling Stranger in the works. MIRRAH is a passionate person and vocal artist with a strong message of self-empowerment, positivity, and unity through loving oneself authentically; believing that communication is the key to learning about one another. MIRRAH is a multi-talented artist with complex variety of achievements. These range from radio host, poet, and rapper to vocalist and she exudes confidence, vitality and professionalism in her every vocation. At present MIRRAH is an active lead vocalist and touring nationally in a working band for Australian Artist L-FRESH The LION. MISTERY hails from Bankstown, Sydney & has been a pivotal person in the development of HipHop culture in Australia since the early 1980s. A Bboy. Emcee & Graffiti Writer he travels extensively both nationally & internationally representing the various elements of the culture at various events, jams & mural projects. His music crew Brethren has been influential in developing the Australian HipHop scene & has been performing continuously for over 25 years, making it one of Australia’s longest running crews. MISTERY now performs with the crew Apollo Creed & is involved in running a Christian HipHop ministry known as Krosswerdz which currently has branches in Australia, Malaysia , Korea & the USA. He is also a Pastor at The Embassy Church in Belmore & works as the Creative Arts Director at the Street University in Liverpool for the Ted Noffs Foundation. DJ MK-1 holds court as one of Sydney’s most authentic, hardworking, innovative and historic radio / club / tour DJ’s, with a grind that is almost impossible to keep up with. DANCEKOOL is the first street dance studio in Sydney with a main focus on Hip Hop. The international teaching base has created the finest expertise available for street dance. Over the past 13 years, DANCEKOOL students have been part of the finest dance battles and events. TEAM 9LIVES is a Parkour movement based out of Western Sydney. The movement has a mission to entertain, educate and inspire communities through visual media, live performances and training. They do this through, but not limited to, Parkour, Tricking, Dance, Bboying and Acrobatics. Bankstown Poetry Slam (BPS) is the larget poetry slam in Australia featuring a special guest poet and a multitude of local talent. Organised and hosted by Sara Mansour and Ahmad Al Rady, this event has to be experienced to be appreciated. BPS is a live spoken word competition where the audience is the judge! STAYFLY Sydney marked the launch of a new community of passionate women who are defining the girls’ corner of the urban movement and exploring Sydney’s potential as a canvas for like-minded ladies.